Grassland Farms community is sold out and is not in active development by builder. If you are interested in Grassland Farms or similar new home communities, contact us today! Our agents are very familiar with new and newer construction in Virginia Beach, and can identify resale opportunities in Grassland Farms, as well as builder inventory available in nearby or similar communities in Virginia Beach. To view 9 more pictures, interactive maps and the full, detailed description of the Grassland Farms community, please Login. Homes for sale in Grassland Farms combine new construction with traditional details. 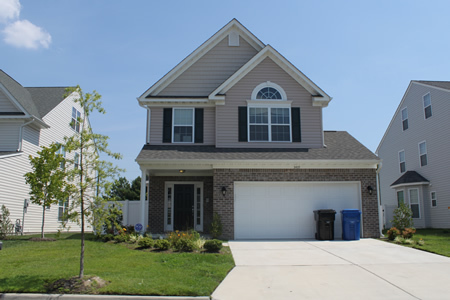 Real estate in this lush area of Virginia Beach, VA, is convenient to anywhere in Hampton Roads. Getting to military bases such as NAS Oceana and Joint Expeditionary Base Little Creek-Fort Story is no problem. Shopping, entertainment and banking are close by as well. These storybook houses allow homebuyers to write their own futures. With all the new construction in today’s real estate market, it can be a bit overwhelming. Enter Grassland Farms. These homes for sale make it easy to see what quality looks like up close and in person. Homes here may include first floor master suite with walk-in closet, master bathroom with dual sinks and garden tub, breakfast area, gas fireplace and more. All this makes it so easy for new homebuyers to move right in. This area of Virginia is a perfect spot for settling down in a picturesque real estate development. Public and private schools are not far and for those wanting to go even further with their education there is Tidewater Community College and other four-year universities. Get back to nature in the Back Bay National Wildlife Refuge that is home to endangered species like bald eagles, loggerhead sea turtles and peregrine falcons. Hard to believe that near new construction lies over 9,250 acres of unspoiled beaches, marshes, fields and woods just waiting to be explored. Buying one of the homes for sale at Grassland Farms can encourage an active lifestyle. Living in a city yet near such serene scenery helps free minds of incessant disturbances. Who knew real estate could actually bring peace of mind? Today’s new construction can be functional and affordable. With nicely appointed, well-constructed homes for sale, Grassland Farms is certainly a choice option for homebuyers. Send me more information about communities similar to Grassland Farms. Our agents gladly offer FREE property tours of Grassland Farms, Virginia Beach and homebuyer consultations to all serious buyers.